This piece uses easy open chords (written above the tab ) with a workout for your little finger ( pinky ). You should hold down the chords as written - you could play the tune without doing this but it won't sound as good and is bad for your overall technique. - next you play open E minor but with the pinky on the top string 2nd fret - you then take the pinky off, play the top string open, and put the pinky back on at the 3rd fret. 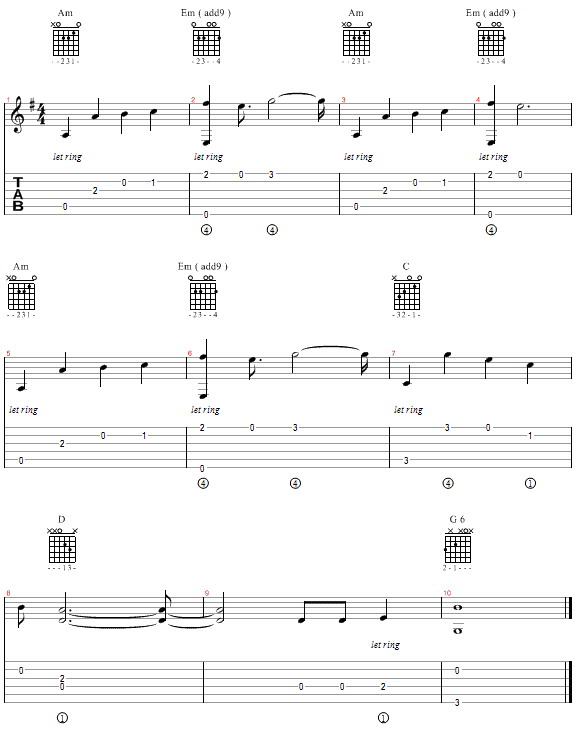 Once you've mastered this bit the rest is fairly straight-forward until the very last chord which is actually a G 6. Use your 1st finger to play the E note just before the last chord. - Let that note ring as you put your 2nd finger on the bottom G and pinch - ( Right-hand thumb and index finger coming towards each other) that note with the 2nd string open. The first soundfile is the tune as tabbed out above. I have also included a second soundfile as an example for more advanced or adventurous players. It is the same tune but with more arpeggios and bass notes - its basically filling out the piece. However in music quite often "less is more" so it is quite possible that the simpler version actually sounds better!